Sterling Silver Left Or Right Nonpiercing Antiqued Wire Wrapped Band Bali Inner Or Outer Ear Cuff. This Antiqued Wire Wrapped Bali Ear Cuff Is Approximately 1/2" By 1/2" And Has A Thickness 1.2mm. 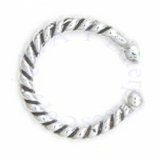 This Left Or Right Pierceless Nonpiercing Outer Ear Cartilage Ear Cuff Band Is Sold Only In Single Units.